A landscaping working who was trimming branches in Holliston recent died after he was severely burned when his chainsaw made contact with a power line. According to the Boston Globe, the 26-year-old worker was completing duties in a bucket truck when the accident happened. According to Deputy Fire Chief Jim Moore, the man was burning in the bucket when emergency responders arrived at the scene. Another employee from the commercial tree cutting company had to push the bucket away from the electrified line so fire fighters could free the man. He was transported to Massachusetts General Hospital and treated for major burns, but later died. Our Holliston workers’ compensation lawyers understand that electrical injuries can be caused by a wide range of voltages but the risk of injury is generally greater with higher voltages and is dependent upon individual circumstances. As there are many stages of an electrical injury, including electric shock, electrical burns, loss of muscle control and thermal burns, they’re all very serious and oftentimes deadly. 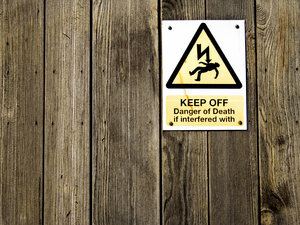 According to the Electrical Safety Foundation International (ESFi), many injuries, deaths and property damage caused by workplace electrical hazards can be avoided. The first step in avoiding these hazards begins with safety awareness. Before undertaking any type of electrical work, plan your job and include all necessary steps to ensure your safety and the safety of those around you. The electrical current in regular businesses and homes has enough power to cause death by electrocution. Even changing a light bulb without unplugging the lamp can be hazardous because coming in contact with the “hot” or live part of the socket could kill a person. To be more specific, electrical dangers cause over 300 fatalities and another 4,000 injuries each and every year. As a matter of fact, these kinds of accident rank in as the sixth most common cause of work-related fatalities in the U.S. On-the-job electrical accident cause an average of 13 days away from work and nearly one fatality every day. If you’re working with electricity on the job, review these safety points to help to ensure a safe workday. There are simple precautions when working with, or near electricity that can be taken to significantly reduce the risk of electrical injury to you and others around you. -Make sure that a detailed job plan is known by all coworkers on the site. -Make sure everyone is aware of the safety requirements, and make sure they’re followed at all times. -Understand the equipment that’s being used and know the hazards involved with this equipment. -Before starting work, make sure that the site has been reviewed and all possible energy sources that could pose hazards have been identified and addressed. -Before beginning work on or near electrical equipment or systems, make sure that load circuits are disconnected. -All employees should be provided with the proper personal protective equipment. -Never assume that an energy source is not live. You always want to test before you touch it. -Be sure that everyone on the work site is using lock-out/tag-out procedures.